Early's Farm & Garden Centre - selling Garden Supplies, Seeds, Fertilizers, Pet Supplies, Livestock Feeds, Grass and Forage Seed, Golf Course Supplies, Statuary, Fountains, Pond Supplies and more since 1907! In 1907, S.A. Early started a hay, grain and feed store in a small frame building on Twentieth Street East, just east of the former location of the Saskatoon Star Phoenix. In addition to running his feed store, in 1909 he joined his cousin, J.H. “Hunter” Early, in a fruit and produce sales operation. Hunter Early managed the wholesale fruit business for a few years but later ventured into the automotive business, establishing the J.H. Early Motor Company located at Third Avenue, presently the site of the Sturdy Stone Government Building. In 1910, the feed store re-located to a site on Wall Street just south of 22nd Street near the present site of the YMCA. From the very beginning, the company developed a “Customer Satisfaction” policy that is still in existence today. S.A. Early pioneered the way for growth and diversification and quickly established the ability to expand with the growing needs of the major move in 1914, when the company relocated to 198 Avenue A South (Idylwyld Drive across the street from the Saskatoon Fire Department Headquarters). S.A. purchased one-half acre of land on which he constructed a grain elevator in addition to a new feed store. 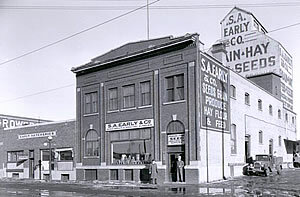 The company continued to keep pace with the general growth and development of Saskatoon and the surrounding area and in 1928, constructed a second elevator adjacent to the existing building. The two elevators facilitated the company’s venturing into livestock feed manufacturing and seed grain cleaning business. While the depression years, known as the “dirty thirties”, were not conducive to growth in the seed business, Early’s forged ahead, pioneering its way into the garden seed packet trade. In 1942, S.A. Early & Co. published its first Spring Catalogue which contained products for sale such as grains, grasses, feeds, poultry and livestock supplies, vegetable and flour seeds, pet food and pet supplies and something new – baby chicks, which were a product of Early’s own hatchery. In 1948, having survived two World Wars and the Great Depression, the company underwent a significant name change; S.A. 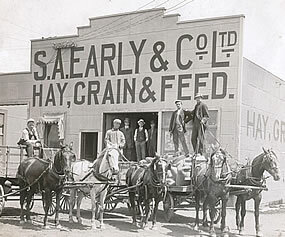 Early & Company became Early Seed & Feed Ltd., a name which more definitively described its main product lines. Under the new structure, S.A. Early, owner, became President while one of his sons, Tom, who joined the company in 1936, became the General Manager. In addition to successfully guiding his own business, S.A. was a prominent and significant contributor to the Saskatoon Business Community as a whole. He served on City Council for 14 years, was a founding member of the Nutana Curling Club and a member of the Saskatoon Collegiate Board. He was active in numerous business related organizations, including the Canadian Seed Trade Association. He was a long time member of the Saskatoon Club and Cosmopolitan Club served as President of Cosmopolitan International. S.A. Early passed away in 1962, leaving a legacy Mission Statement that continues as the cornerstone of the company’s service policy today. In recognition of the major role that S.A. played in “early” development of the City of Saskatoon, a Saskatoon street, Early Drive was so named in his honour! Upon his father’s passing, Tom Early became president of the company which had expanded its operation including a retail store in North Battleford, a poultry hatchery, a hog ranch in north Saskatoon and seed grain cleaning in Aylsham, Saskacthewan. Over the years, new product lines were continuously surfacing that included beekeeping supplies, agricultural fertilizers and herbicides, and an on-going demand for the company’s own manufactured brand of “Sunlight” livestock feeds. Tom himself, a shrewd business man with a somewhat flamboyant character, guided the company through several trying years. With the continued growth of business, in 1966, Tom ventured outside the family tree and hired a young but somewhat experienced individual, Joe Bloski, to assist him in managing the 60-year-old company. This proved to be the beginning of the development of a strong management team which in 1967 included the hiring of Andy Kobiela, a feed nutritionist with seed cleaning expertise. In 1971, John Bloski joined the company primarily to oversee the warehousing and distribution of agricultural and horticultural supplies. Rounding out the management team was the Accountant/Office Manager, Mary Clynton, who worked for the company for 27 years, retiring in 1979. Some streamlining of the company’s operating began to take place with the sale of both the Battleford store and Aylsham elevator to enable management time to focus on the Saskatoon retail and manufacturing facility. In spite of again experiencing success under the new management team, time began taking its toll on the aging buildings and fatigued equipment. It became apparent that changes were imminent of the company was to continue into the 21st Century. The continued redevelopment of the downtown area, Midtown Plaza, was in itself forcing the question of Early’s viability at its Idywyld location. In 1982 a major reconstruction of the company’s ownership began to take place. Through Tom Early’s foresight and leadership and with the support of two long time employees, Joe and John Bloski, Early Seed & Feed Limited became Early’s Farm & Garden Center Inc. For the first time in the 76-year history of the company, it now had shareholders outside of the Early family, as Joe and John Bloski became partners with Tom Early. Mr. Early was the major shareholder and assumed the position of President. However, the entire business operation was entrusted to Joe Bloski as General Manager and John Bloski, who became Assistant to the General Manager. 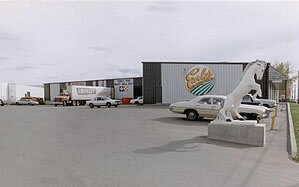 Shortly thereafter, plans for relocating began to take place on February 23rd, 1983, Early’s Farm & Garden Centre Inc. opened its doors to a new facility at 2615 Lorne Avenue. This move marked the beginning of a new era for Early’s! Gone was the feed manufacturing and the seed cleaning plant but more significant was the demise of the downtown location which had been a prominent city landmark for 70 years! As product lines continued to change with a greater emphasis on retail, the history of the company’s seed and feed business still maintained its high profile position. Management recognized the opportunity to capitalize on the golf course boom and aggressively pursued marketing not only the sale of seed but other golf course amenities. Early’s became a major supplier to new projects like the Willows and Elkridge Golf Resort and expanded its marketing to approximately 200 golf facilities throughout Saskatchewan, Manitoba and Alberta. The new 25,000 sq. 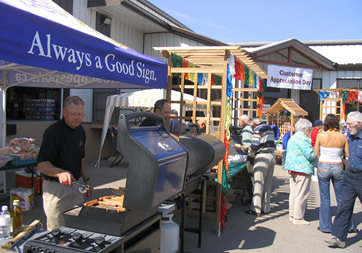 ft. facility also enabled the company to expand its garden product line and pet supply department along with saddlery and tack. Early’s ability to be flexible and change with the times while maintaining S.A. Early’s Mission Statement of Policy, “Commitment to Customer Service”, paved the way for its success into the 21st Century. Although the move to Lorne Avenue was a major risk, it did open its doors to new opportunities. Through its general growth and expansion, the company’s profile in the community was experiencing new levels in both company participation and management’s involvement in varied community events. The Bloski/Early family management team grew as well with Joe’s son Derek having joined the company in 1982, Tom’s son Spencer (third generation Early) in 1984, and Kevin (Joe’s second son) in 1995. Tom Early took full retirement in 1995 after having spent almost 60 years of his life with the company. In addition to his work, he spent five years in the Navy during World War II, was an active person in the community and business related organizations. He served in various capacities in the Cosmopolitan, Saskatoon and Usadian Clubs and was an avid golfer as a member of Riverside Country Club. Tom was noted for his support of business organizations such as the Canadian Feed Manufacturers Association and the Canadian Seed Trade Association. In 1989 he was the recipient of an Honorary Life Membership in the CSTA. T.H. (Tom) Early passed away September 30th, 2005 and, not unlike his father, had left a legacy of business principles and history for generations to come. Following T.H.’s retirement in 1995, his son Spencer became President, maintaining the Bloski/Early Management combination. The growth of the company continued with the opening of a second location at 502 – 51st Street. Undoubtedly, one of the main factors in contributing to the company’s ability to continue its diverse growth and expansion throughout its 100+ year history is its staff! Long term, dedicated, loyal staff of 36 people strive daily to deliver S.A. Early’s Mission Statement of Policy. In 2001, Joe and John Bloski sold their respective shares to Spencer and Jan Early but continue with the company in Management roles. Joe Bloski worked for Early's for 49 years until his retirement in 2015. While his brother John Bloski passed away in 2012. Joe's two sons Derek and Kevin Bloski now manage the day to day operation of the business. There are many factors that have contributed to Early’s successful 100+ year survival. Perseverance, dedication, commitment, foresight, entrepreneurship and just plain hard work may have brought the company to where it is today. However, the main factor contributing to the company’s longevity is its PEOPLE! People in the work place and people in the community. S.A. Early set a standard that has been successfully maintained throughout history. The Early Companies and their management have displayed a high level of involvement and support of community and business organizations; whether it’s in the Arts, Business, or Sports and Leisure, it’s the kind of commitment that will enable Early’s to continue to achieve success in the next 100 years! In 2017 Early's is celebrating our 110th year of business and we want to take a moment to thank you for your continued loyalty and support of our store! We love what we do and we couldn't do it without you! Our current staff are dedicated and knowledgeable in their respective departments, and together we have almost 500 years of combined experience! We are so thankful for the dedicated staff we have, and together with our friendly and loyal community of customers we are grateful for the past, present, and future of Early's Farm and Garden Centre! There are LOTS of new and exciting things coming to Early's in 2017. Your favorite pet, garden, tack, and more store is always searching for new products and ideas to make your shopping experience more enjoyable. We hope to see you soon!